Know all the steps? When you've got it going on, you're bound to heat up, and nothing cools you off faster than the Swing Dance Drink Ticket. 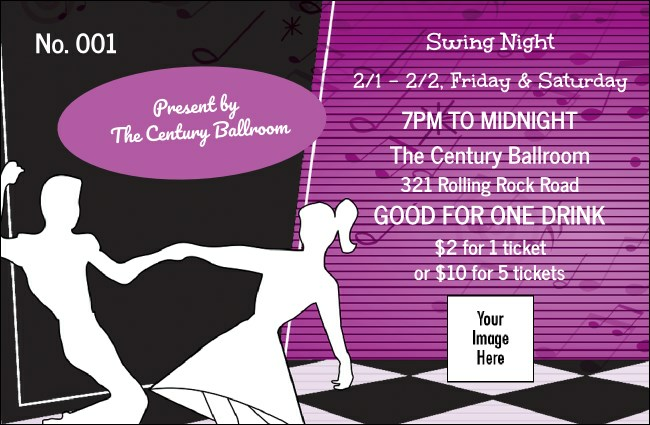 In purple with the silhouettes of a dancing couple tripping the light fantastic on a checkered floor, this Drink Ticket template matches the other Swing Dance publicity materials. Keep the bar in order with TicketPrinting.com's Drink Tickets.